See more objects with the tag figures, allegory, mythology, sculptors, craftsmen, sculpture. See more objects with the color darkolivegreen rosybrown dimgrey tan or see all the colors for this object. This is a Drawing. It is dated late 17th century and we acquired it in 1938. Its medium is pen and brown ink, brush and brown wash, black chalk on white laid paper, laid down. It is a part of the Drawings, Prints, and Graphic Design department. Léonard Chailleau was a French sculptor active in central Italy, where he was known as Leonardo Scaglia, or simply il Francese (“the French”). Known as a skilled woodcarver, he produced work for numerous church interiors in the Marche and Umbria regions. 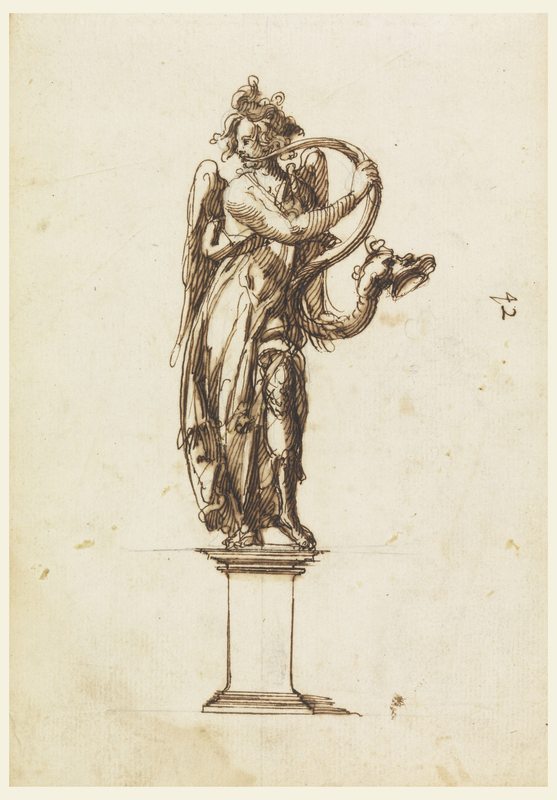 This fluid sketch of an angel blowing into a serpentine horn was likely a preliminary design for a sculpture as part of an ecclesiastic commission. Angels and putti feature prominently in Chailleau’s extant work. This object was catalogued by Megan L. Smith. It is credited Museum purchase through gift of various donors and from Eleanor G. Hewitt Fund.